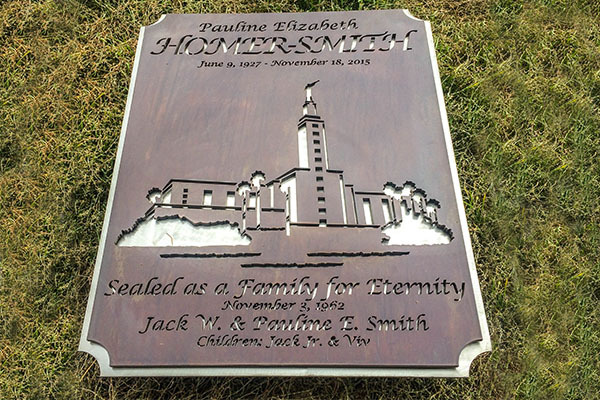 At Smith Steelworks, we design and manufacture custom laser cut cemetery signs or plaques. The memorial plaques are a beautiful alternative to a headstone that will weather beautifully. 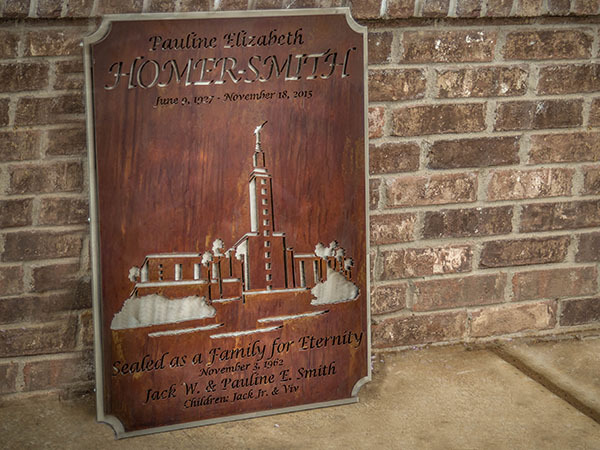 Each metal plaque is available with fully custom design options including: inscriptions, portraits, temples, and more. 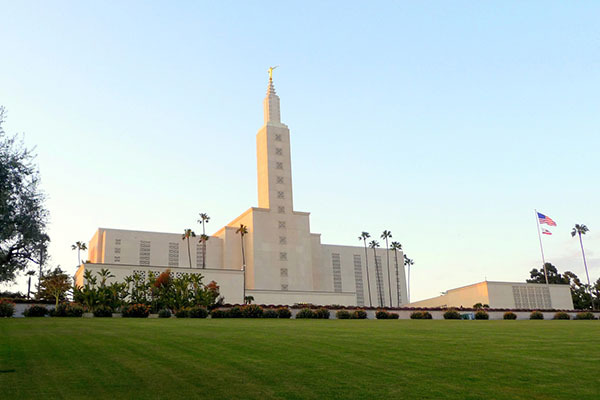 Give us a call at (801) 414-1724 or click the button below to get in touch. Our team will work with you to create a custom cemetery sign that helps capture the story of your loved one. Below is an example of how the sign process works. To get started on the cemetery sign, send us your ideas, drawings, PDF’s, photos, etc. that you would like incorporated into the design. Our team will create a realistic proof of how the finished cemetery sign will look. It will be emailed to you for final approval. The metal plaque is sent to laser cutting. It is then powder coated or rusted, assembled, and then mailed directly to you. 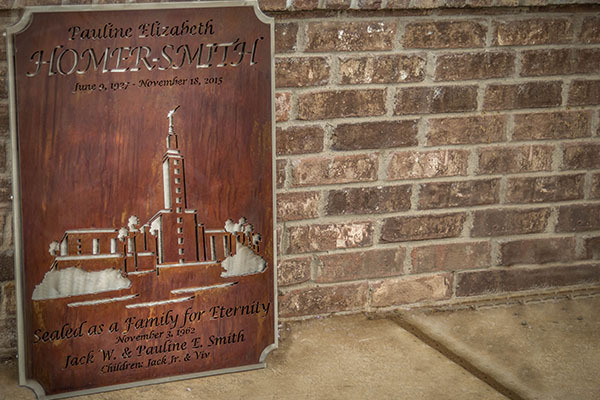 At Smith Steel Works, our cemetery markers and signs are fully customizable. Send us images, sketches, your ideas, etc. and our team will turn them into a metal piece. When ordering, be sure to send us the dimensions. We customize each order to fit the location and installation of the final product. Each cemetery place marker is designed to withstand all types of weather conditions, thanks to our powder coating process. The powder coat creates a durable, weatherproof finish that protects the metal from corrosion and rust. We use a fiber optic laser that provides precision cuts for high-quality and customization. This allows our designers to use more detail than ever before. They can even take photographers and have them laser cut into the cemetery marker. Looking for another way to pay tribute to your loved one? 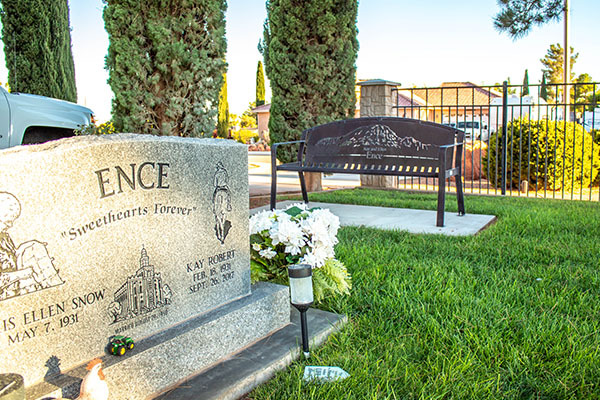 At Smith Steelworks, our team also manufactures personalized memorial benches for cemeteries and parks. Each metal bench is available with full laser cut design options including: inscriptions, images, and sceneries. Give us a call at (801) 414-1724 to get started with your project! Our memorial plaques are a perfect alternative to a basic headstone that include laser cut designs. 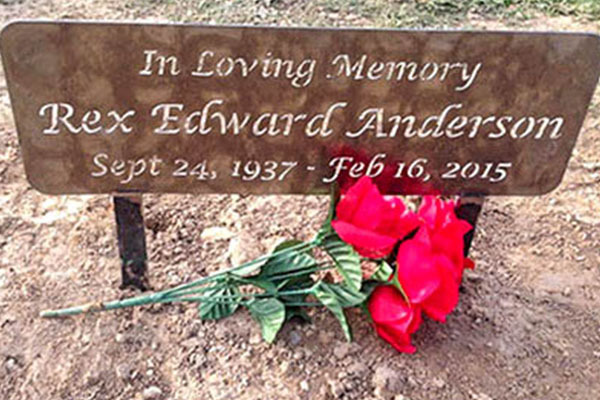 Sometimes a simple plaque is one of the greatest ways to mark a loved ones gravesite. The cemetery signs are available with multi-layer options, providing premier customization. Have a current headstone? We are capable of creating a memorial bench to compliment the monument.